It is hard to believe it has been two years since Tia’s surgery! She is very playful and happy – so glad we did this! I can tell she feels much better now than she did before the surgery! Here is a nice compilation of her showing how normal she acts and is now! The only thing that is different is she doesn’t counter-surf anymore, and she has fully trained me to scratch the ear on her missing leg side for her! Anyone who is going through this now, have hope! It is very rough recovering from the surgery, but they really can bounce back to being happy, normal kitties just with 1 less leg!! Missed Tia’s official one year anniversary, but I still wanted to post an update! She has been doing really well, and still manages to chase down her sister and win play fights. She will scramble up the cat tree as fast as any other cat and has generally adjusted very well. 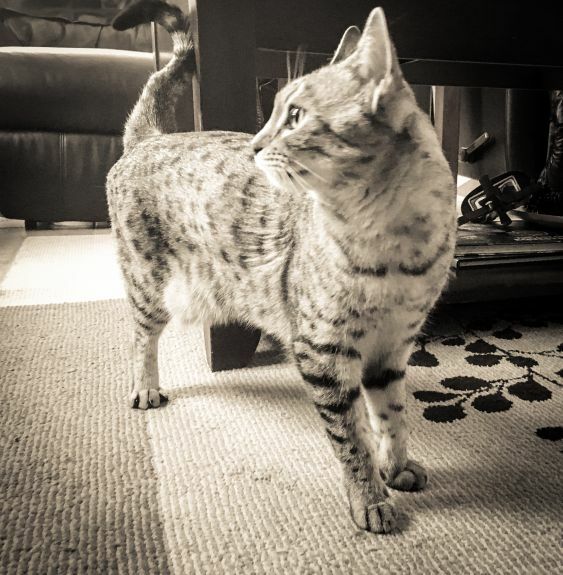 So, the vet was right – cats can do very well with just three legs and we are glad we made the decision. I still worry about that one remaining hind leg in the back of my mind, but we will keep her weight down and hopefully she will be good for a long, long time! 6 months post-op: Looking good! Tia gets more and more agile as the months go by. She did gain some weight after the surgery, probably due to less activity, so we are trying to exercise her more. She can get up onto counters and jump up the cat tree or onto her favorite chairs. Overall, its been going really well. 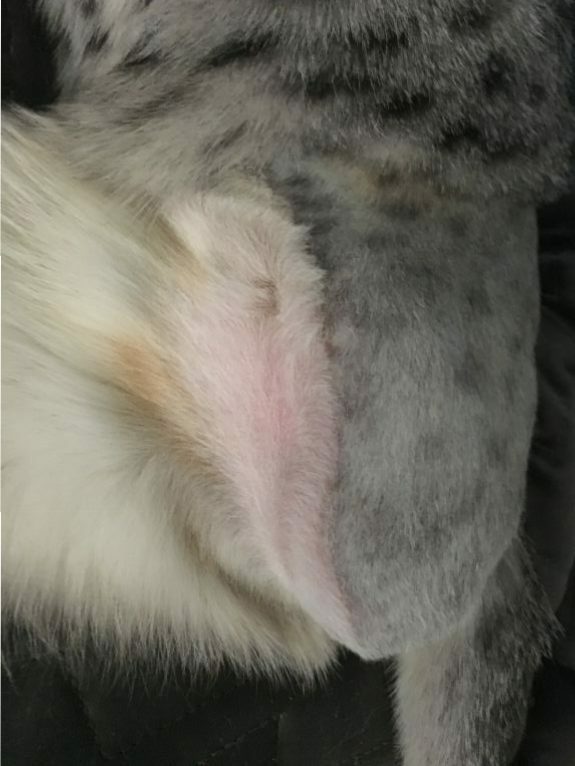 We noticed her coat is very soft and smooth now, where before the surgery it was a bit rough. I suspect the tumor was affecting her system more than we knew. Its been two weeks and 1 day since Tia’s surgery! She is doing amazingly well. As far as accommodations go, we still have some stairs up to a higher favored perch and a low-sided litter box. But she is now able to jump up on a lower window perch as well as the bed easily. I have modified the “normal” litterbox with a step stool (its high sided because we have a standing pee’er cat) so we will try to see if she will use that this weekend. 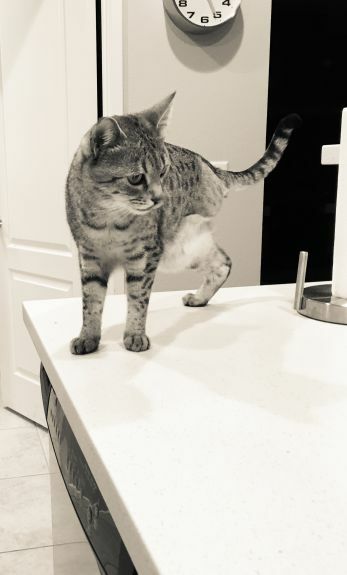 She has not ventured up on any kitchen counters as of yet, but I expect she will eventually be able to make those jumps as well (although I was enjoying not having to shoo her off of counters). Here is a video of her playing with a fishing toy – she hardly seems slowed down by her missing leg. You can really see her tail working on that balance, though!